The Battery Wash Recycling System receives dirty water pumped from the Battery Wash System for treatment. First, an integral automatic pH adjustment control activates to raise the water to a neutral (safe level) pH of 8 for the removal of metals. Second, a reactive separating agent is introduced to the water and agitated, allowing the separating agent to encapsulate the contaminants and form large flocculent. Using gravity flow, the treated water is separated from the floc by passing through an automatic deep bed filter. The captured sludge is conveyed to a sludge catch bin, where it dries and hardens into a non-hazardous, non-leachable sludge. The sludge is certified landfill friendly for standard trash disposal. This is a closed loop system that removes contaminants and particulates, insuring that the recycled water is cleaned to continuously supply the battery wash cabinet. 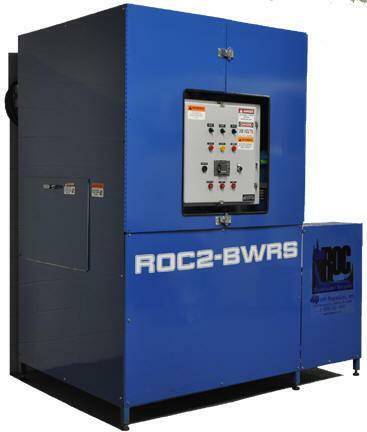 In addition, the recycler system is constantly ozonated to remove bacteria (BOD) for odor control.